The Zune: Now a Viable iPod Alternative? 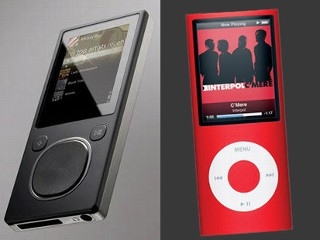 "The Zune has a long way to go to become a threat to the iPod. But it is getting closer...and it became clear that there are a few things Apple can learn from the Zune...I found the Zune's Marketplace feature easy and definitely satisfying...Mixview is miles above the Genius feature...clearly Microsoft is making strides - and maybe making consumers think twice before running out to buy a new iPod." The smattering of quotes above were pulled from this ABC News article that compares the Zune to the new Apple Nano iPod. What's worthy of noting is that while the article clearly acknowledges that Apple is the market leader, the Zune measures up quite nicely against Apple's newest Nano. Even more worthy of noting is that since the new Zune 3.0 software and devices launched in September, I've been watching the reviews and articles take on a decidedly more positive tone toward the Zune compared to what was written about it in November of 2007. When Zune 1.0 came out at the end of 2006, it was widely lambasted by the media - it was only on Zune sites such as this one that you'd see positive coverage. I'd be remiss in not mentioning though that I never finished my written review of the Zune 1.0 because there were so many things I found frustrating about it - so I think much of the negativity toward the Zune 1.0 was deserved. It looked and acted like a product that was rushed to market. The Zune 2.0, however, was a different story. All new hardware, all new software: this was the device that Microsoft needed to launch in the first place. While some of the press around the 2.0 launch was positive, by and large the media coverage was quite negative - few people thought that the v2.0 Zune was a worthy option to the iPod. I believe much of the negatively was simply because it was a Microsoft product, the company that people love to hate. It's also not a coincidence that many of the media use Apple products - they've been hating Microsoft for decades. With the Zune 3.0 launch I've noticed a subtle but important shift in media perception: whether it's the new added features of 3.0, or just the fact that the Zune has been around long enough to make it to a third generation, the general attitude I see now in the media is that the Zune is a viable alternative to the iPod Nano and iPod Classic. There's still no Zune answer for the iPod Shuffle or the iPod Touch, but most of the media is fair enough to recognize that and not ding Microsoft for it.